If you take a close look at some of the iconic Boston baseball photographs created at the turn of the 20th century by Elmer Chickering, you might see him. He’s the mustached chap in the bowler cap holding his Brownie camera with Hi-Hi Dixwell at the groundbreaking for the Huntington Avenue Grounds; he’s the guy in his skivvies being pulled out of icy winter waters after swimming polar-bear style at the L Street Baths; he’s the head peeking over a Pittsburgh Pirate’s shoulder in a first-base-line team portrait taken during the first World Series; and he’s the Royal Rooter posing with a platoon of the Red Sox faithful holding a fistful of dollar bills and a megaphone in front of Boston’s South Station upon his arrival from Pittsburgh after singing “Tessie” at Game Seven of the 1903 World Series. “Nuf-Ced” McGreevy was his name. Base ball was his game. As a gregarious and popular barkeep, McGreevy quickly carved a niche for himself as a leader and organizer of many of his patrons who were fellow members of the Boston Elks Lodge and who shared his love for sport, particularly baseball. Boston, along with New York, Baltimore, and Philadelphia, had significant contingents of dedicated fans with close ties to the game’s early days, including Boston’s Arthur “Hi-Hi” Dixwell and New York’s Frank “Well-Well” Wood, who both gained notoriety as the sport’s most devout and vocal fans. In the 1880s New York City establishments like Nick Engel’s Home Plate steakhouse and saloon incorporated baseball themes and decorations and embraced ballplayers and the characters associated with the game. A rabid fan of the New York Giants, Engel organized a group of fans known as the High and Mighty Order of Baseball Cranks of Gotham, and also led a contingent of 160 New York fans by train to Baltimore for Opening Day in 1894. When McGreevy opened his saloon the same year, he was following in the footsteps of Engel who was already exhibiting assorted cabinet photographs of players on the walls of the “Home Plate” and incorporating personal souvenirs from players like a telegram he’d once received from King Kelly, who also owned a New York City saloon with ex-umpire Honest John Kelly called the Two Kell’s. Famous for his tenderloin dinners, Engel regularly entertained the greats of the game including John Ward and Buck Ewing and when he died in 1897 at the age of 52, the members of Boston Elks Lodge No. 10, likely including McGreevy, traveled to his funeral service in New York City to pay their respects to one of the game’s greatest fans. Perhaps influenced by Engel’s Home Plate, McGreevy took the concept of a baseball-themed saloon to a new level and gradually transformed his establishment into a gallery of baseball photographs and lithographs that immortalized his customers’ favorite players. Operating in a politically charged era when Irish politicians, including Mayor Pat Collins and Congressman John F. “Honey Fitz” Fitzgerald, were consolidating their ethnic base in Roxbury and the neighborhoods beyond, McGreevy emerged as an organizer and leader in a community that was consumed by baseball. McGreevy and his customers mimicked the pubs from the old country that served both as watering holes and clubhouses for soccer teams and other athletic organizations. In Roxbury McGreevy and his fellow cranks were devoted to the hometown Beaneater baseball clubs managed by Frank Selee that featured native New England stars like Hugh Duffy, Fred Tenney, Marty Bergen, and a third baseman from Buffalo named Jimmy Collins. The trip of 1897 laid the groundwork for McGreevy’s more formalized contingent that would later become known famously as the Royal Rooters, a group dedicated to traveling and rooting for Ban Johnson’s newly organized American League club in Boston that snatched Jimmy Collins and other stars away from the longstanding fan favorite Beaneaters. As noted by Boston Globe scribe Tim Murnane, a Royal Rooter sat atop the world of fandom, distinguishing himself as a cut above the lower classes of baseball fans for his willingness to travel on his own dime to root for his club in enemy territory. McGreevy and his men revolutionized the concept. By 1900 McGreevy had moved his Linden Park saloon to a larger space in a standalone structure at 940 Columbus Avenue in Roxbury, located equidistant from the South End Grounds and the site of the Huntington Avenue Grounds, which was built the following year. In 1901 McGreevy, Tim Murnane, and 19th-century fan extraordinaire Hi-Hi Dixwell appeared with a large contingent of Boston Rooters to break ground for the new ballpark on Huntington. McGreevy placed a photograph of the groundbreaking ceremony in a display window at his new location, the first of many in his collection that would embrace the new American League franchise that swayed Roxbury loyalties from the National League. By the time the new American League club played its first game in Boston, in 1901, McGreevy’s bar was known as the 3rd Base Saloon, nicknamed as such because it was said to be any fan’s “last stop before home.”5 However, the name appears to have also been in part a tribute to local hero and third baseman Jimmy Collins, upon whose shoulders the success of the fledgling American League franchise rested. With Collins already in the American League camp, it only took cheaper ticket prices to secure the full devotion of McGreevy’s Rooters for Boston’s entry in Ban Johnson’s competing big league. McGreevy’s saloon became the headquarters for the baseball community during the season and extended well into the Hot Stove League during the winter. Season after season, the establishment gradually was transformed into what would become baseball’s first true museum, with nearly every square inch of wall space dedicated to small and large mounted pictures of former Boston teams and massive individual portraits of stars dating back to King Kelly and the heroes of McGreevy’s youth. Game-used equipment, including gloves and balls, was hung behind the bar and McGreevy went so far as to fashion the game-used war clubs of star players like Cy Young, Nap Lajoie, and Freddie Parent into lighting fixtures that hung from the high ceilings of the saloon. At the end of the bat barrels were affixed frosted glass domes transformed into baseballs with hand painted laces.7 Players and fans commiserated and drank among McGreevy’s collected relics of the game with characters who were also notorious odds-makers and gamblers like Joseph “Sport” Sullivan, who would later be implicated in the scheme to fix the 1919 World Series. It was likely at McGreevy’s that Sullivan first became friendly with Eddie Cicotte a decade before the scheme was hatched at the nearby Buckminster Hotel. At McGreevy’s 3rd Base Saloon, baseball and betting went hand-in-hand and McGreevy was the arbiter of all baseball arguments and skirmishes. With so many visiting baseball writers, players, and executives frequenting his establishment, Nuf-Ced began to cultivate a national reputation as baseball’s most devoted fan, one who also had the inside dope on the diamond at his disposal. When McGreevy returned to Boston on the same train as Cy Young and the team after the “Tessie”-fueled victory, he was unaware that some fellow Rooters had dressed up the exterior of his saloon with patriotic bunting and a painted sign hailing the Boston club as soon-to-be World champs. The Boston Globe reported how upon his return McGreevy, “one of the prime movers of the Pittsburg trip,” would be surprised to see 3rd Base decked-out in his honor.9 Atop the entrance of the 3rd Base Saloon the life-size mannequin known as McGreevy’s “Baseball Man” was dressed in a flannel Boston uniform doing his best impersonation of King Kelly and looking down upon the horse-drawn buggies and carriages that made their way down Columbus Avenue towards the ballpark. Riding the momentum of the notoriety he received during that first World Series, McGreevy was further embraced by the baseball press and transformed into a local celebrity with his exploits (just like those of the players) rendered in cartoons drawn by Wallace Goldsmith and Sid Green for the Boston daily newspapers. As much as Michael T. McGreevy was devoted to the Boston baseball teams, he was just as much in love with the game itself. 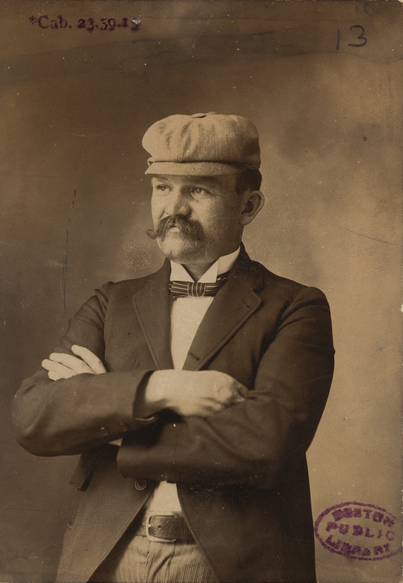 When his beloved team failed to make it into the postseason in 1906, he still traveled to Chicago for the first intracity World Series, between the White Sox and the Cubs, and was recognized in the national baseball press for his acquisitions of several large photographs of the 1906 Series.”12 In January 1906, the New Year’s resolutions of baseball notables were published in the sporting papers, including Cy Young’s desire to “pitch a few more no-hitters” and Ban Johnson’s vow to call Charles Comiskey a “good fellow.” After the Series of 1906, Nuf-Ced made good on his published resolution: “To get a few more souvenirs for his champion collection.”13 It was in 1907, however, that Nuf-Ced made his greatest acquisition to date after learning that a gold medal presented to King Kelly as the Champion Base Runner of the Boston team in 1887 had been deposited in a New York City pawnshop window looking “tarnished, dusty and forgotten.”14 Knowing how much he wanted it, his fellow Rooters purchased the medal for $200 and presented it to McGreevy at the 3rd Base Saloon, where the 33rd-degree rooter polished it and placed it in a display case for all fans to see. A histry uv the game in pikturs, The tok uv the base bal world. “Kum, Kum b alyv, b alyv, Get in the game.” Nuf Ced M.T. McGreevy 940 Columbus Av. According to the Boston Post, as early as the spring of 1905, McGreevy was proving himself as a “bit of a player” against the big leaguers. The Post quoted Cy Young as saying that he could get McGreevy signed by a team in the South if he ever agreed to cut off his mustache.19 McGreevy regularly suited up in his own Boston uniform and played so well in exhibition games in 1908 that the manager of the Natchez club of the Cotton States League saw him playing in Hot Springs and actually inquired if he was available for purchase. Playing the manager for a fool, Red Sox owner John I. Taylor fielded a first offer of $200 and promptly upped the price to $300, which was accepted. Upon learning that he was sold, McGreevy said to the Natchez manager, “I guess you’ve been handed a good sized lemon.” Realizing he’d been had, the Natchez man first drew for his gun, but realizing the prank was good-natured and the joke was on him, calmed down when the Boston men bought a few rounds for his men.20 Thus grew the legend of McGreevy, who was described in the Arkansas Gazette as a “wonder” discovered by President Taylor and “in all probability a member of the Boston team for the upcoming season.”21 It was also reported that Hugh Duffy had attempted to buy him for the Providence club and Barney Dreyfuss for the Pittsburgh Pirates. One spring Nuf-Ced even jokingly signed an official contract with the Boston club. McGreevy was also famous for showering the real players with gifts and awards and at spring training in 1908 he offered a diamond ring to the Boston player who could steal the most bases during the coming season. It was said that his offer would “increase the number of those who try to steal ‘Third Base’ on the way home.”22 Making good on his word at Hot Springs in 1909, McGreevy proffered a “nice speech” and presented winner Amby McConnell with an impressive $250 diamond ring. It was in the year of 1912, in the newly constructed Fenway Park, that Nuf-Ced McGreevy and his Royal Rooters reached the apex of their careers in baseball fandom. They rooted Jake Stahl’s Red Sox all the way to the American League pennant in the newly christened ballpark, and the rooting alliance between McGreevy and John F. “Honey Fitz” Fitzgerald reached new heights. McGreevy attended every World Series and in 1911 sat in a section reserved for official scorers and the press at the Polo Grounds in New York and at Shibe Park in Philadelphia. In 1912 the Royal Rooters returned to October form, led by McGreevy and Fitzgerald, who by then was the well-established and powerful mayor of Boston. Challenged by the Giants of John J. McGraw and Christy Mathewson, McGreevy and Fitzgerald organized the largest-ever contingent of Royal Rooters to travel to New York City; the mayor secured 300 tickets from the Giants, although there was an army of 1,000 Rooters who wanted to make the trip. McGreevy’s fellow Rooter, the bandleader Johnny Keenan, said, “We are through with the Red Sox, so far as the rooting goes, and we will not attend the final game tomorrow as a body.”33 Lots of fans followed suit and only 17,034 showed up at Fenway for the deciding game of the World Series. However, the Rooters’ stand may have had more to do with McGreevy and the boys having inside dope that the Series wasn’t on the level and, perhaps, may have known that the Red Sox would win the deciding game as rumors swirled that players were disgruntled with management. Notwithstanding, McGreevy and the Rooters jumped back on the bandwagon quickly as the Red Sox took Game Eight from the Giants and the world championship returned to Boston. With Boston’s return to baseball prominence and another world championship under McGreevy’s belt, the Rooters continued their support of both the Red Sox and Boston Braves franchises. In 1914 McGreevy organized another road trip to the World Series in Philadelphia to support George Stallings’ Miracle Braves against Connie Mack’s Athletics. Nuf-Ced produced specially printed song cards and badges for the Royal Rooter, contingent, which included Mayor Fitzgerald, his newlywed daughter, Rose, and her husband, Joe Kennedy. Both newlyweds sported “Royal Rooter” badges made especially for the Series by McGreevy and Fitzgerald. However, Nuf-Ced would miss the Braves’ victory after receiving the tragic news of his brother’s death in Maine via telegram at the Series. While Nuf-Ced McGreevy was mentioned every now and then in the Boston newspapers in the 1960s and 1970s, baseball’s greatest fan and Boston’s Royal Rooters faded away into relative obscurity. In 1970 historian Harold Seymour and his wife, Dorothy, utilized Nuf-Ced’s collection for Baseball: The Golden Age, but it wasn’t until 1979, when authors Daniel Okrent and Harris Lewine published The Ultimate Baseball Book, a coffee-table tome that featured numerous selections credited specifically to the Boston Public Library’s “M.T. McGreevey Baseball Picture Collection.” It was the first time in years that the general public got a peek at a large portion of the images that once graced the walls of the nation’s first and foremost sports bar, and it sparked the interest of other baseball authors who sought out rare and captivating baseball photography from the turn of the century. In the early 1990s filmmaker Ken Burns worked with the McGreevey Collection and in 1994 Nuf-Ced was reintroduced to a national audience in the award-winning documentary film series Baseball, which featured a full segment under the title “Nuf-Ced” and utilized the library’s images of the 3rd Base Saloon, McGreevy, and the Rooters. In 2000 Stout and co-author Richard Johnson began their definitive Red Sox history, Red Sox Century, with a scene from McGreevy’s 3rd Base Saloon and incorporated many of Nuf-Ced’s images throughout the book, as did the 2005 book Boston’s Royal Rooters and the 2007 documentary film Rooters: Birth of Red Sox Nation, both written by this writer. When Rooters aired on the cable channel NESN, Red Sox fans witnessed for the first time the original 1906 motion pictures of Nuf-Ced frolicking in the flesh with the rooters and “brownies” at the L Street Baths. Whether it was sheer luck or the ghost of Nuf-Ced McGreevy assisting the band, each time the Dropkicks played “Tessie” live at Fenway Park during the 2004 playoff run, the Red Sox won as they brought home the first World Series championship to Boston since Nuf-Ced and the Rooters traveled to Chicago singing “Tessie” in 1918. They repeated the feat for the postseason of 2007. In 2008 Dropkick Murphys frontman Ken Casey and this writer reopened McGreevy’s 3rd Base Saloon at 911 Boylston Street in Boston in a faithful replica of the original bar with reproduction and original pictures from McGreevy’s original location, including the original painted glass portrait of Nuf-Ced that hung behind the original back bar in Roxbury. In the past few years, other McGreevy gems have appeared for sale on sites ranging from eBay to Sotheby’s, and thanks to additional recovery efforts spearheaded by McGreevy’s 3rd Base Saloon, some of those rare and historic images have been returned to the institution Nuf-Ced originally donated them to. The most notable recovery was that of the 1904 photograph of John L. Sullivan and Jimmy Collins in the Red Sox dugout. The Boston Public Library stamp on the photograph had been defaced and obscured to conceal its McGreevy provenance but was still visible when it was sold as part of New York Yankees partner Barry Halper’s collection at Sotheby’s in 1999. In 2008 the Boston Globe reported the recovery of the iconic photograph after it was offered for sale online by a dealer in Maine and purchased by the reconstituted McGreevy’s 3rd Base Saloon. In the article headlined “A Home Run for the BPL,” library official Aaron Schmidt, who had been instrumental in assisting the recovery effort, said, “Every time we get one of these back it’s like a homecoming. Of all the ones that we’re missing this is No. 1 in terms of importance.”54 The photograph was put on display in the museum showcase at the revived McGreevy’s 3rd Base Saloon on Boylston Street. When I had to decide what spelling to use for the reconstituted 3rd Base Saloon at 911 Boylston Street, I considered all of Stout’s information as well as additional information available at the Boston Public Library, the Suffolk County Courthouse, and in the U.S. census and Boston directory records. I found that although Nuf-Ced’s birth was recorded with the surname “McGreevey” in the official Roxbury ledgers in 1865, he signed his last will and testament, in 1938, as well as other documents including the lease of his bar property to the library in 1920, as “M.T. McGreevy.” The only surviving photograph of Nuf-Ced in front of his first bar location at 17 Linden Park (circa 1894) shows the name “McGreevy” hand-painted on the business sign. In addition, the vast majority of Nuf-Ced’s baseball advertisements printed on scorecards and programs sold at the Huntington Avenue Grounds bear the “McGreevy” name, including the advertisement for the bar on the cover of the program sold at the first World Series in 1903. This biography can be found in "New Century, New Team: The 1901 Boston Americans" (SABR, 2013), edited by Bill Nowlin. To order the book, click here. Probate Records of Michael T. McGreevy, Suffolk County Courthouse, Boston. 1 McGreevey Timeline by Glenn Stout, M.T. McGreevey Collection, Boston Public Library. 3 Boston Globe, clipping undated. 4 Sporting Life, October 2, 1897. 5 “Nuf Ced’s Bar Fond Memory To Sox Attache,” Boston Traveler, undated clipping. Author’s collection. 6 John Drohan, “Nuf Ced’s Bar Fond Memory To Sox Attache,” Boston Traveler, undated clipping. Author’s collection. 7 Boston Traveler, April 23, 1923. 8 Lawrence Ritter, The Glory of Their Times (New York: Macmillan, 1966). 9 Boston Globe, October 12, 1903. 10 Boston Journal, October, 1904. Clipping otherwise undated. McGreevey scrapbook. 11 Boston Herald, October, 1904. Clipping otherwise undated. McGreevey scrapbook. 12 McGreevey Scrapbooks, Boston Public Library. 13 McGreevey Scrapbooks, Boston Public Library. 14 McGreevey Scrapbooks, Boston Public Library. 15 Rooters: Birth of Red Sox Nation (Cooperstown Monument Co./Killswitch Productions, 2007). 16 McGreevey Scrapbooks, Boston Public Library. 17 Boston Sunday Post, January 19, 1913. 18 McGreevey Scrapbooks, Boston Public Library. 19 Boston Post, February 1906. Clipping otherwise undated. McGreevey scrapbook. 20 Arkansas Gazette 1906. Clipping otherwise undated. McGreevey scrapbook. 22 McGreevey Scrapbooks, Boston Public Library. 23 Arkansas Gazette, 1906. Clipping otherwise undated. McGreevey scrapbook. 24 Los Angeles Express, February 28, 1911. 25 McGreevey Scrapbooks, Boston Public Library. 26 McGreevey Scrapbooks, Boston Public Library. 27 Boston Globe, January 28, 1910. 28 McGreevey Scrapbooks, Boston Public Library. 29 Baseball Magazine, February 1910. 30 Boston Post, undated clipping in McGreevey scrapbook. 31 McGreevey Scrapbooks, Boston Public Library. 32 Peter J. Nash, Boston’s Royal Rooters (Charleston, South Carolina: Arcadia, 2005). 33 McGreevey Scrapbooks, Boston Public Library. 34 McGreevey Scrapbooks, Boston Public Library. 35 McGreevey Scrapbooks, Boston Public Library. 36 Boston Post (undated clipping) McGreevey Scrapbooks, Boston Public Library. 37 Michael Reiskind and Peter O’Brien, “Boston’s Lost Breweries,” Jamaica Plain Historical Society. March 25, 2006. Transcription posted on the Society’s website. 38 Boston Traveler, April 28, 1923. 39 Letter from Charles Belden to Michael T. McGreevy, May 3, 1923, McGreevey Papers, Boston Public Library. 40 Boston Evening Transcript, April 24, 1923. 41 Boston Post, December 3, 1926. 42 Boston Post, August 21, 1930. 43 Boston Evening Transcript, 1939. Clipping otherwise undated, author’s collection. 44 Glenn Stout, McGreevey Timeline, Boston Public Library. 45 Boston Globe, June 3, 1938. 46 Boston Globe, February 18, 1943. 47 The Sporting News, February 11, 1943. 48 “Nuf Ced’s Bar Fond Memory To Sox Attache,” Boston Traveler, undated clipping. Author’s collection. 50 Boston American, May, 1955. Clipping otherwise undated. 51 Author interview with Glenn Stout via e-mail January 2013. 52 “Tessie,” Dropkick Murphys, 2004. 53 Author Interview with Sinclair Hitchings, 2009. 54 Boston Globe, December 31, 2008. 55 Glenn Stout, Fenway 1912 (Boston: Houghton Mifflin, 2012).